1) At First, spring creates an instance of the Bean using Java Reflection API. 2) If there are any properties associated with bean then spring injects those properties. If there are any bean as a peoperty then spring finds that bean and inject it. 3) If the Bean class implements the BeanNameAware interface, then the spring will call setBeanName()method by passing the name of the Bean. 4) If the Bean class implements the BeanFactoryAware interface, then the spring will callsetBeanFactory() method by passing an instance of BeanFactory object. 5) If there are any BeanPostProcessors associated with the BeanFactory that loads the Bean, then the spring will call postProcessBeforeInitialization() method before the properties for the Bean are injected. 6) If the Bean class implements the InitializingBean interface, then the spring will callafterPropertiesSet() method once all the Bean properties defined in the Configuration file are injected. 7) If there is any custom init-method declared in the configuration file, that method will be called. 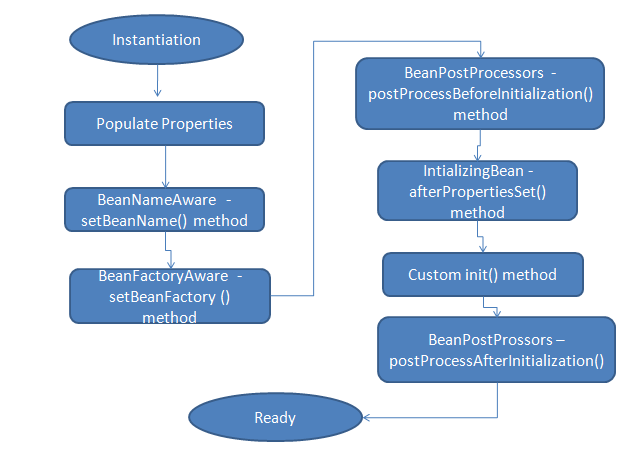 8) If there are any BeanPostProcessors associated with the BeanFactory that loads the Bean, then the spring will call postProcessAfterInitialization() method. 9) Now bean is ready for use. Spring Framework provides InitializingBean and DisposableBean marker interface. Implementing these interfaces will result in the container calling afterPropertiesSet() for the initialization and destroy() for the destruction to allow the bean to perform certain actions upon initialization and destruction. The easiest way to control a bean’s lifecycle is by using the two lifecycle annotations above custom methods that will be invoked upon bean initialization and destruction.